All symphonies are dramas - dramas of contrast and emotion, whether by classical composers or romantics. I was 45 before I felt technically competent to write my first symphony. I started work on a long cherished scheme, grandiose in scale, but a project that I hoped might constitute a major contribution to the development of the symphony. I planned four symphonies as a sequence - No. 1 was the exposition; No. 2 the slow movement; No.3 a march-scherzo with coda; No. 4 the epilogue. You will find the thematic material for all four in No. 1 but essentially each work had to be a satisfactory entity in itself. What had given Alwyn the technical competence to begin this new venture? His music for the concert hall included two Concerti Grossi, the Oboe Concerto, two overtures and a piano concerto, but there were, as yet, no large-scale works written for the modern symphony orchestra. Nevertheless, as principal flautist of the London Symphony Orchestra, he had been constantly involved in orchestral work and, even more importantly, for the past 13 years, he had been facing the problems of the new art of writing music for the British Documentary film movement. These films were made on seemingly impossible budgets, which strained all my ingenuity and resource to conjure the best possible music from the smallest possible means, for the first time made me stop and think how essential is the possession of an unflawed technique for the proper realization of one's creative ideas. Each film score I wrote was an opportunity for experiment and an exceptional chance, given the splendid orchestras who played the score, to improve and polish my technique and widen my dramatic range. Alwyn's music accompanied great war-time documentaries such as Desert Victory, The Way Ahead and The True Glory as well as many other short films on such unlikely subjects as Potato Blight, Harris Tweed and Rat Destruction! His 60 feature film scores include Odd Man Out - surely one of the greatest film scores ever written - The Magic Box, The Fallen Idol, The History of Mr Polly, and The Rake's Progress. All these had given him the opportunity to write for orchestras large and small, to experiment with varying groups, and, above all, to hear the result of his scoring immediately at the recording. Music is the art of sound, it has no life on dead paper, it does not live in the eye but in the ear. The circumstances in which a composer writes a work do not necessarily affect his music. This happy symphony was written under extremely adverse circumstances in the weeks preceding a major throat operation from which Alwyn knew that he had only a 50/50 chance of survival. Its first performance by its dedicatee, Sir John Barbirolli and the Hallé Orchestra, was at Cheltenham in 1950 - at the festival inaugurated soon after the war with the principal aim of giving prominence to contemporary British Music. The work had a great reception from audiences and critics alike, who praised its imagination, eloquence, brilliant scoring and the wealth of flowing melodies. There's beauty, grace and charm in the world yet; and plenty to live for. My Symphony might almost be described as an optimistic challenge. ....your magnificent recital. I was really tremendously thrilled - particularly with your Liszt Sonata, which was a great performance. As to my pieces, I could not have wished for a better reading of them. But you left me consumed with desire to write a big work for you - something really worthy of your ability. If it is the performers intent to inspire, then you have inspired me with a supreme confidence in your future as a pianist, and on my part, inspired me to wish to attain better things. My dear Clifford, I feel myself very deeply in your debt! The concerto is in one continuous movement which falls into four easily recognizable sections. The work opens (Allegro deciso) with a vigorous rhythmic statement of the second main theme and is followed, without a break, by what is, in effect, the slow movement (Adagio tranquillo) - a quiet development section of the previously heard subject matter. The initial tempo is resumed and leads to a re-statement of the first idea. This is elaborated and builds up to a big orchestral climax which quietens into the Coda, or Epilogue (Adagio molto e tranquillo) - a peaceful and very quiet transformation of the second theme on the piano, with a subdued orchestral accompaniment. The work dies away to nothing over a sustained string chord. AIwyn's First Symphony is an essentially flamboyant work dating from 195O and appropriately dedicated to Sir John Barbirolli who conducted its premiere. The first movement is passionately rhapsodic, the Scherzo, in the words of the composer, "roistering and tumultuous" (and scored with spectacular vividness) but there is plenty of repose in the bittersweet Adagio with its main theme introduced on the Cor Anglais. The finale is boisterously rhetorical and extrovert. It is not a difficult piece and associations with the composer's film music spring readily to mind as the structure moves easily from event to event. Perhaps this is why Richard Hickox's new version and the composer's 1977 recording for Lyrita- are so alike. Uncannily in both the timing of the Adagio ma con moto is exactly 9'52. Of course the ebb and flow of the music is different each case but Hickox is naturally attuned to the idiom and it obviously fires him for his account has all the passion and depth of feeling of the composer's own version. The Chandos recording is spaciously, richly digital. It is obviously more modern and has a slightly wider dynamic range - one notices this especially in the Scherzo but the Lyrita stands up splendidly to any direct comparisons and certainly does not lack body, impact or colour. So one could be happy with both, or either, and choice between the two depends on the coupling. The composer offers the Fourth symphony, a more mature piece, less inclined to let its ideas run away, as in the irrepressible finale of the first. Hickox gives us the Piano Concerto, a much earlier work, written specifically for Sir Clifford Curzon, who was a fellow student with the composer at the Royal Academy of Music. It is ambitious in style and manner, with the epic feeling that was to make the composer so good with films. In one movement, divided into four sections, it opens with a genial toccata which frames the Adagio tranquillo and after returning leads on to a wistful epilogue. It is not thematically particularly memorable, but like the Bliss concerto has a certain panache, and in this splendid account from Howard Shelley, combines a real sweep with gentle, introspective lyricism. The recording is on a comparably large scale and is very believable. 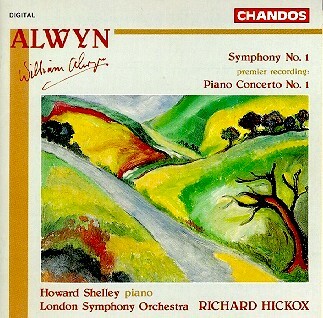 Richard Hickox's determination to promote Alwyn is proving to be one of the more imaginative British artistic ventures of recent years and this superb disc should carry the standards even further. Hickox has a deep understanding of Alwyn's score and gives the First Symphony a reading which combines lucidity with passion. Two elegiac Adagio movements alternate lyrical melodic Allegros - Alwyn wrote the piece while waiting for a throat operation with only a 50 per cent chance of survival, although anything less like Mahlerian music under the shadow of death would be hard to imagine and Hickox persuasively reads the music's moods, digging well beneath the surface Charm. The real treat, though. is the 15- minute Piano Concerto, reminiscent, though in no way derivative of Prokofiev: Alwyn's use of the keyboard has that same engaging Combination of percussive effect and melody. Howard Shelley makes the piece sound as though it should be a permanent part of the repertoire especially in competitions. Two superb performances, both with excellent Chandos sound quality: a fine disc. Richard Hickox's Alwyn cycle for Chandos is fairly galloping along! CB was muted in his reception for the first two releases in this series last August. I, for my part, respond rather more favourably to Alwyn's defiantly neo-Romantic stance. True, there are strong echoes here of Sibelius, Walton, Bax, and other English minor masters, but at the same time I'm impressed by the craft and deceptively subtle rigour of Alwyn's symphonic thinking. In this respect, neither of the symphonies here matches the achievement of the excitingly cogent Third (1956) - a work which, I recall, won passionate acclaim for its inner logic from no less an authority than Hans Keller - but there's still much to admire and savour. Of the two symphonies, the First (1949) is the more effusive and undisciplined, yet its invention is always memorable and the cumulative impression it leaves touchingly fervent and heartfelt. The compelling two-movement Second (1953) is undoubtedly a tauter, more tightly organized creation (it was the com- poser's own favourite of the five) and, like its predecessor, benefits from some quite resplendent scoring - as a one-time principal flautist with the LSO, and then prolific film-music composer, Alwyn had acquired a formidable knowledge of the workings of the orchestra. Howard Shelley makes an exemplary protagonist of the early First Piano Concerto from 1930; dedicated to Clifford Curzon (a fellow RAM student), it's an impressively assured single-movement work, at times reminiscent of Rachmaninov and Prokofiev, on whose own First Concerto it was most likely modelled. The Second Symphony comes in harness with a selection of less substantial offerings. I remember the lively overture Derby Day would often crop up on R3's old 'Morning Concert' programme, whilst the Barbirolli-commissioned Symphonic Prelude The Magic Island is a bit like Bax's Garden of Fand revisited. Having acquainted myself with much of this music from the composer's own renderings from the mid-'70s for Lvrita (now on CD and still sounding superbly vivid), I would never have thought that this repertoire would offer the opportunity for comparative listening so soon! Fine as those Lyrita versions are, Hickox lends an extra imagination and intensity to Alwyn's vision - he certainly secures more disciplined, full-throated orchestral playing: under the composer, LPO strings suffer from occasional bouts of raggedness. Different venues (All Saints', Tooting for Symphony 1, St Jude's, Hampstead for 2) produce equally convincing, lustrous results from the Chandos engineers. Hearty recommendations, both. Hickox's performance of the First Symphony is just as compelling as the composer's own version on Lyrita (coupled with No. 4 - SRCD 227). Its unashamed flamboyance and energy, helped by Chandos's spectacular recording, brings great vitality to the music, while the opulent textures make the very most of the composer's spacious tapestries -of sound - so reminiscent of his best film music - and, if the finale nearly goes over the top, the exuberance is highly communicative. The poignant atmosphere of the Adagio is equally well caught. The First Piano concerto is also a flamboyant piece, written in 1930 for Clifford Curzon. It is in a single movement, but with four clear subsections: the toccata-like energy of the opening is only partly dispelled by the slow section, which alternates tranquillity and passion, before the joyful return of the toccata leads to a peaceful epilogue of considerable beauty. Howard Shelley is a splendid soloist, fully up to the rhetoric and touching the listener when the passion subsides, creating a haunting stillness at the very end. Again splendid recording.